Hello everyone! My blog's been a bit quiet lately (well, only since last Thursday - ha!). The kids were on spring break last week, and having them home just made the days that much busier. I was also crafting up a Christmas storm for Paper Crafts' Submission Call (keeping my fingers - and toes - crossed). City Crafter - it's their birthday, and the challenge is to CASE one of their designers cards from the gallery. I chose my friend Linda Robinson's card. She used green/neutrals, polka dots, a white flower (I used white flower lace) and an animal, so I picked out those features. The giraffe is cute, isn't he, with his party hat and frilly collar. He was $1 at Michael's. I created the background paper, stamping a Harlequin pattern and Manuscript on retired dotted SU paper. 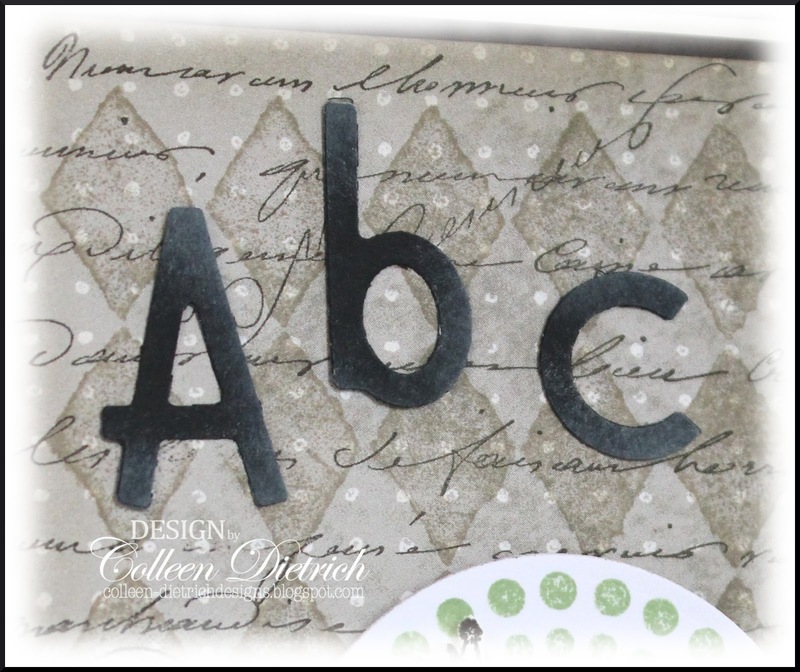 The alphabet die cuts were in one of those $1 Scrap Bags from my SU demonstrator (thanks, Gail!). I just sponged some white ink to soften their edges. Just wanted to share that a few of my cards were featured last week, brightening my days. At Cardabilities, I was the Featured Designer for 'Easter Wishes'. At Moxie Fab World, I was a Practical Solutions Challenge Winner for 'Age is a Number'. And at Frosted Designs, I was Spotlighted for 'King of My Heart'. I have a new post at my photo blog, bleu hydrangea, if you'd like to visit. Thanks so much for joining me today! I hope you have a beautiful day. Paper: Very Vanilla, Early Espresso, Whisper White - Stampin’ Up! ; Patterned paper: Stampin’ Up! Ink: Whisper White, Crumb Cake, Early Espresso, Wild Wasabi, Basic Black - Stampin’ Up! Oh, a party giraffe...how adorable. I'll have to check Mike's for that one. Your card is just too cute. Those alphabet dies really were perfect. I took yoga classes...many years ago. Hope you find the right place so you can enjoy it. Sweet baby is right! 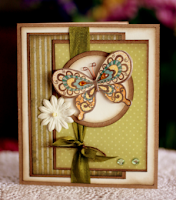 Love the soft stamped background and the green dots - so pretty! Colleen this is so sweet...i love that amazing giraffe..
What a great card Colleen, love the party hat on the giraffe! Sounds like you had an interesting weekend ;) I don't think I would do well in a 90 degree humidity filled room either LOL!!! But the pretty harp music does sound inviting ;) Thanks for your love on my blog, I love it when you visit ~ hugs. This is so sweet and I have not heard of that challenge either! Big congrats on adding to your trophy case as well! Love the BG stamps you used and the green really pops on the card. Good on you for stepping out to try something new. Great mother/daugther time too :) Hope you find a place your asthma can handle. Absolutely adorable...what a fabulous mix of elements! Great lettering, awesome background stamping and sweet image! Love the colors, too! Marvelous take on Laurie's card! I think some studios do 'hot yoga' which I wouldn't do as a beginner. Your body is working hard enough without struggling to breathe! I'm sure that you'll find a studio more suited to your comfort level. Good luck with it, I'm sure it will make you feel good! That is so sweet, thanks for playing along with us at CCCB! What a sweet card! What is it about giraffes? Wow Colleen, it was great to hear about your Yoga experience and I hear you on the muscles and the allergies. I save Photos of cards I like so I can CAS too! You did an outstanding job and how creative with the things you liked. I love the circle, the sentiment and the pearls, and that Giraffe is totally cute cute cute~ Love the lace against the punched border too!! Have missed your blog. It is always a treat!! The BG is awesome too! Ive been away too long and this card is a wonderful way to come back. I love this cutie; the background, the "lace"border; the desi'gn. Cute and gorgeous. I knew it; your signature of beauty is written all over this handmade jewel! Congrats on being featured; so well deserved. I am happy to hear you had a fun and relaxing weekend. So sweet! And what a fabulous mix of stamps! Good for you trying Yoga. I keep saying I want to try it! I hear its so good for you! Your card is so sweet so glad you played along with us at CCCB! Congrats on all the kudos - did that make sense? Anyway, you know what I mean! Cute giraffe - at first I couldn't tell what it's party ruffle was until I saw the hat. Too funny and too cute. What a sweet baby card Colleen! Love that giraffe - so cute! So glad you enjoyed the yoga. It's not for me. I get so bored and all I want to do is get on a cardio machine and burn calories. I know you're supposed to be able to do that in yoga - but I just can't do it!! I think I might have adult ADD!! Keeping everything I can get crossed crossed for both of us on the PC call (with the yoga you can probably get more things crossed than I can)!! Such a darling take on Linda's card !! Thanks for joining us for our birthday this week! I love the card Colleen and in particular the background works so beautifully. Not sure why I'm always drawn to the background first - perhaps because I love creating them? The colours are so soft and yet they stand out so well especially the soft green. Yoga? Mmm not for me but good on you for going! You always find the neatest $1 stamps, Colleen! This one with the die cuts makes an adorable baby card. Anyhoo, wonderful project, love the colours and layout!